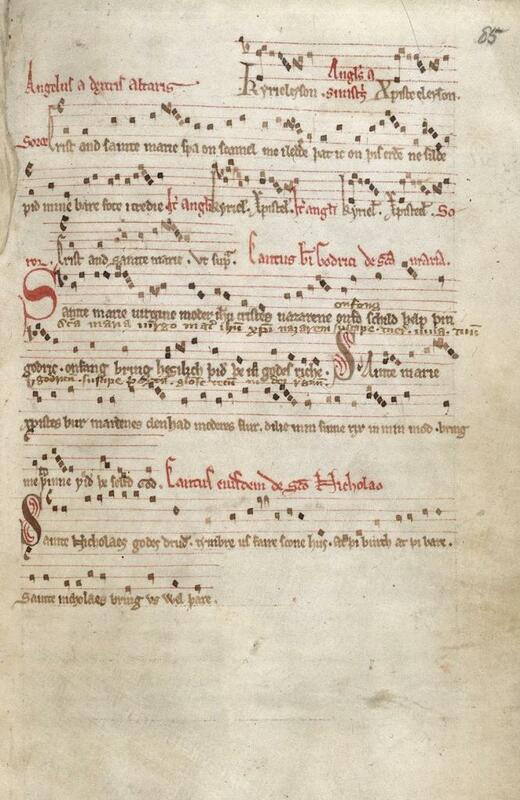 Godric of Finchale, who died on 21 May 1170, was a merchant-turned-hermit and saint who is also one of the first named English songwriters - at least, his are the first songs in English for which the music survives. He was born at Walpole in Norfolk just after the Norman Conquest (c.1070), to English parents, and he became a successful merchant, trading and sailing to Scotland, Denmark and Rome. He undertook several pilgrimages, but (partly inspired by a visit to St Cuthbert's Farne Islands) he was drawn to the life of a hermit, and eventually settled at Finchale near Durham, where he lived for the last sixty years of his life. Godric's most famous song also came to him in a vision: the Virgin Mary told him to sing it whenever he was tempted, weary or in pain, and she would come to his aid. Received, bring him on high with you in God’s kingdom. In the first verse, Godric is playing on the meaning of his own name: godes riche means ‘God’s kingdom’. These verses already have some of the motifs which would later become so popular in Middle English devotional poetry, especially the romance tinge of Mary as 'bower of Christ', and the flower imagery. (The interpretation of the third line is disputed, but this is the reading I'd go for - in other words, asking for Nicholas' help from birth to death). These verses are fascinating, partly because they provide a glimpse into the obscure and much-underrated world of twelfth-century English literature. The traditional view for a long time was that the thriving vernacular literature of Anglo-Saxon England came to an abrupt end at the end of the eleventh century, not to re-emerge until some time in the thirteenth - as if the Norman Conquest made everyone forget overnight that they had ever told stories or sung songs or heard homilies in the English language. Much did change, of course, but scholarship is increasingly showing the traditional 'rupture' model to be much too simplistic. Godric's songs are an interesting case-study in this context. The verses are more than competent, the use of rhyme particularly - this clearly isn't somebody fumbling around with poetic techniques he didn't understand. As far as we know Godric had no formal education, and tracing the cultural influences of someone who lived such a well-travelled and varied life is a tricky endeavour. However, his Fenland origins are especially intriguing, because we do have a little evidence for vernacular song in the twelfth-century Fens - Cnut's song from Ely is my favourite example, but there may also have been verses about the local heroes Hereward and Waltheof (and as for English prose, monks at Peterborough, Ely, Crowland and Ramsey - the houses closest to Godric's native Walpole - were all certainly reading and in some cases writing English well into the twelfth century). 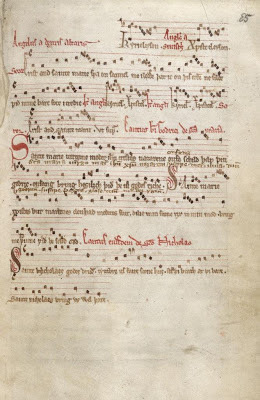 It's just possible that Godric grew up with a tradition of English song, and that his verses should thus be seen as a development of this rather than a complete innovation. There's much about them that's new (bower/flower rhymes, for a start), and they are justly celebrated as a 'first' - but they didn't come out of nowhere. Thank you for this. I am directing this play in a church with wonderful acoustics. I want to add music and am doing the research necessary to choose such music. That sounds lovely - I'm glad you found this post helpful. Hauntingly beautiful. Sorts out the tangles of Monday morning. "All simple-souled, dove-hearted and dove-eyed"